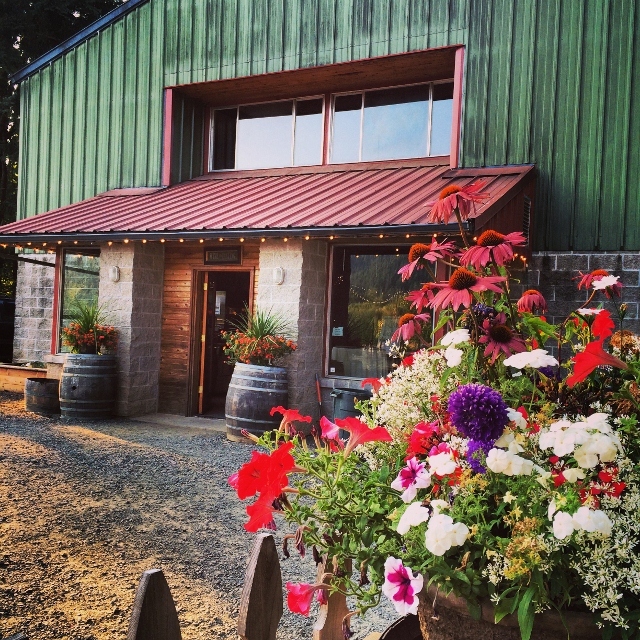 Domaine Meriwether is the South Willamettte Valley’s only producer that focuses on sparkling wine. 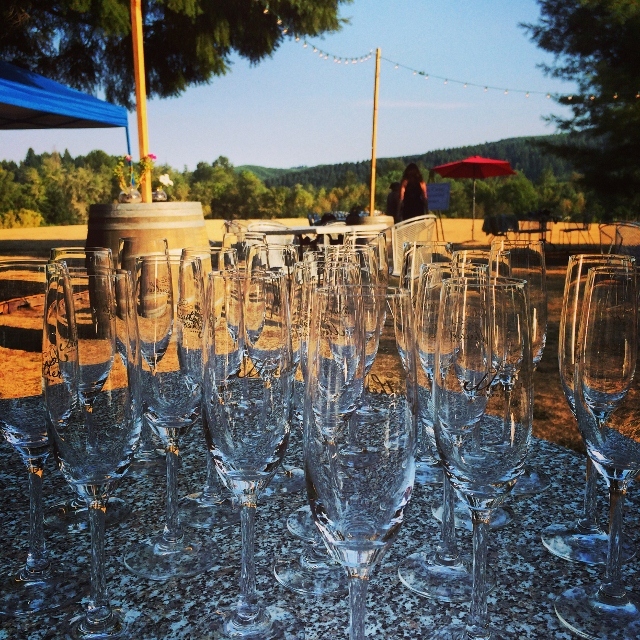 Although their production includes incredible still wine, their sparkling wine is some of Oregon’s finest. The property is situated at the foothills of the Coastal Range, just outside of Eugene, Oregon, with a beautiful view to the southwest. Summer sunsets are a memorable sight when witnessed from the inviting picnic tables that are strewn throughout the lawn in front of the tasting room. The winery sits amid 54 acres of gently rolling hills lined with dense brush and forest. 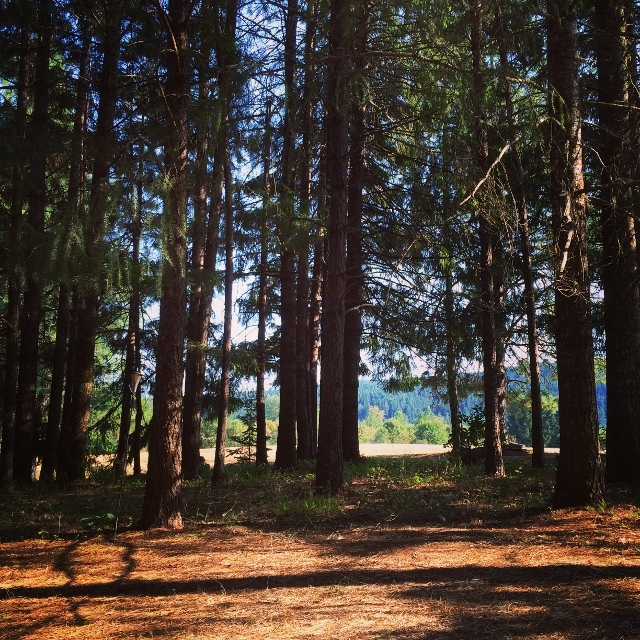 Some of the forested land sits just yards from the winery and is an idyllic space for camping with its towering pines and level ground. 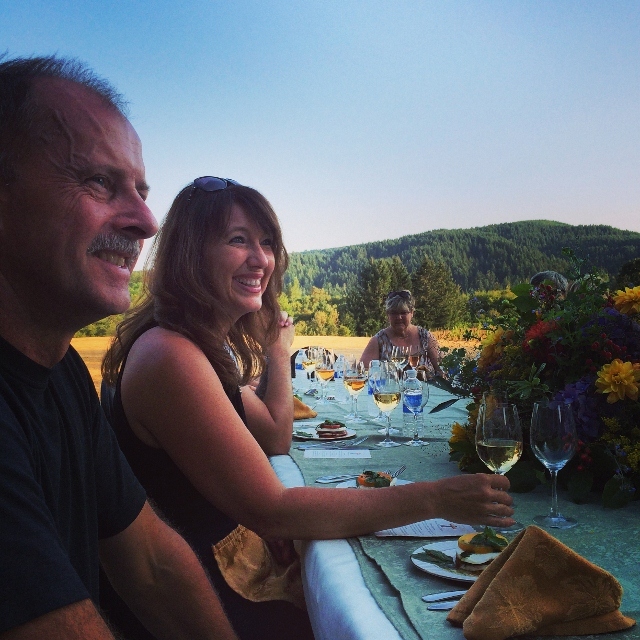 A stroll through this area prompted conversations and visions of vineyard camping between Domaine Meriwether owners, Lorrie and Eric Normann, and their marketing guru friend, Denise Rossetti of Rossetti Marketing and Wine Events Oregon. 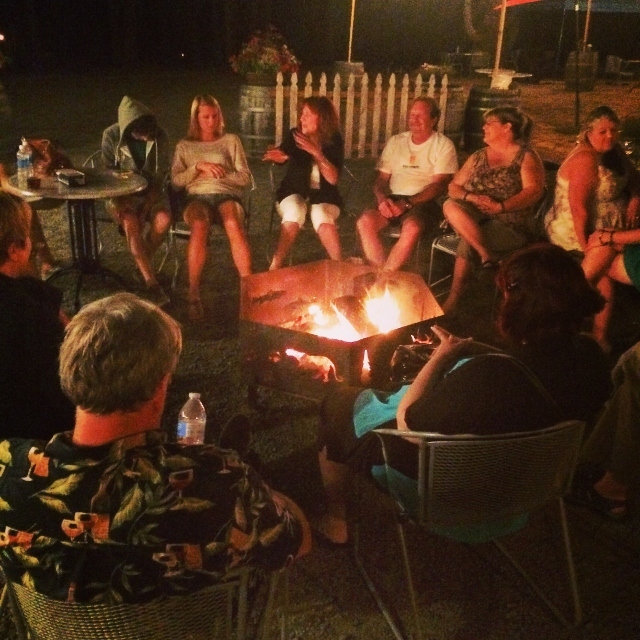 Their conversations and visions of wine enthusiast campers enjoying mimosas by a bonfire became a charming reality when Wine Camp came to fruition. 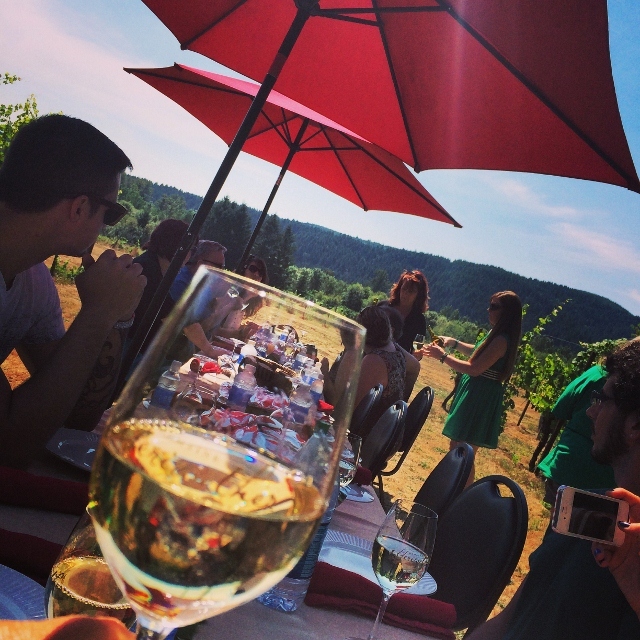 The inaugural Wine Camp took place in August 2014, over the course of two days and one night of camping, on sun-centric Saturday and Sunday. Campers were encouraged to arrive early Saturday morning to choose their preferred spot among the tall pines, and anything from small tents to fully-loaded RVs were welcome. With about 20 campers confirmed for the inaugural weekend, we arrived early to find a spot perfect for our pop-up camper. As we set up our Margaritaville-themed camper, complete with a parrot wind sock, tropical-colored chairs and hanging paper lanterns (clearly expressing our adoration of a by-gone era of Jimmy Buffett concerts and life in the tropics), we noticed other campers had their own fun styles and themes going, as well: Lorrie and Eric Normann’s lavish tent sported an actual queen size bed, night stands and an armoire; along with, a folding screen that perfectly hid their “rest-room.” Next to the Normann’s was a tent and surrounding area decked out with traditional University of Oregon Duck colors and paraphernalia. 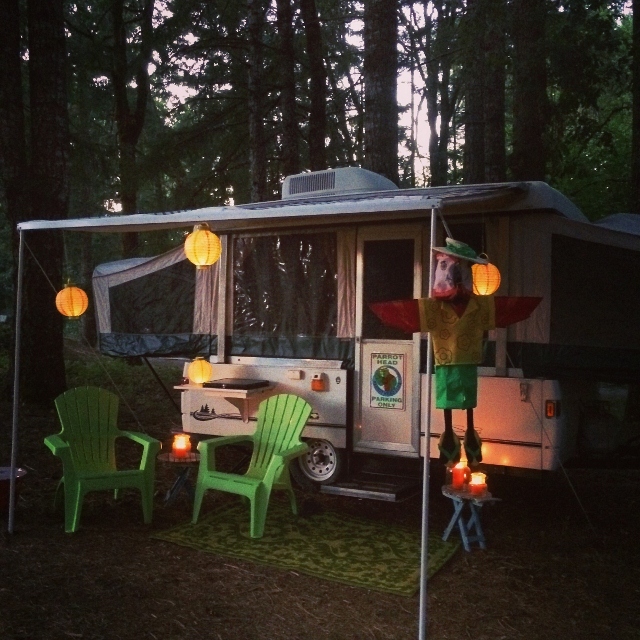 Although decked-out tent sites was not a requirement, it was certainly a conversation starter. After setting up camp, Saturday’s fun-filled schedule of activities began with a welcome Mimosa and lunch in the vineyard hosted by the Normann’s. Catered by a single chef working solely from her food truck, Stacy Sullivan of Comfort’s Mobile Cuisine pulled together an impressive meal for our group, and camp-food instantly took on a whole new level of deliciousness: fresh fruit salad, grilled sourdough bread, Chicken Picatta Pasta and a cup of sorbet drizzled with sparkling wine. The chilled wine selection served with lunch was equally impressive; including, a 2012 Domaine Meriwether Riesling and a 2006 Domaine Meriwether Pinot Gris that beautifully showcased the elegant ageability of Oregon Pinot Gris. Tasty and relaxing with a sunny view of the Coastal Range foothills, lunch ended with Meriwether owner, Eric Normann, leading us through the vineyard while demonstrating the importance of vine canopy management, followed by a remarkable technical tasting hosted by his wife, Lorrie. Campers blind tasted a variety of Willamette Valley Pinot Noirs while Lorrie weighed in on the fundamentals of tasting professionally. We rated the wine as we sipped; in addition to, taking note of the relevant clarity, color, aroma and flavor profiles of each wine. 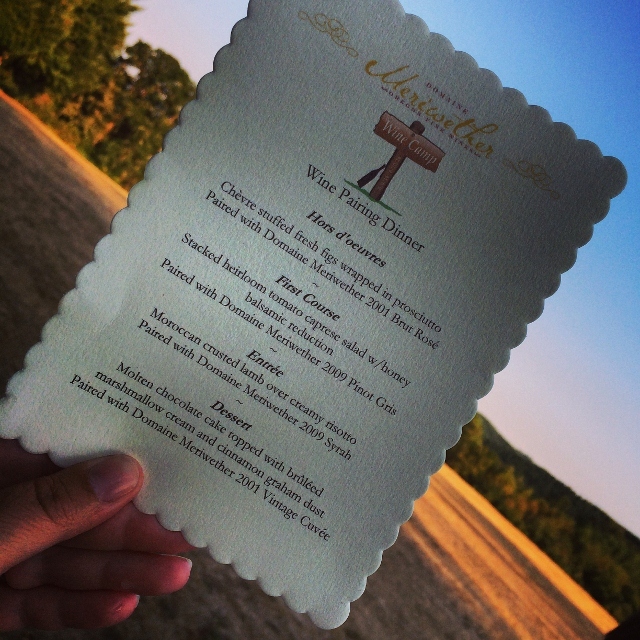 Once Lorrie revealed the paper bag-laden wines, the technical tasting was officially over when a bubbling and sparkling flute filled with Domaine Meriwether’s Discovery Cuvee was given to each of the campers who were then directed to a trailer with bales of hay attached to a tractor. With owner Eric Normann at the helm of the tractor, a guided jovial hayride of the property demanded an occasional stop so campers could enjoy a swill of the chilled cuvee before bumping along the rustic, yet breathtaking, 54 acre property. 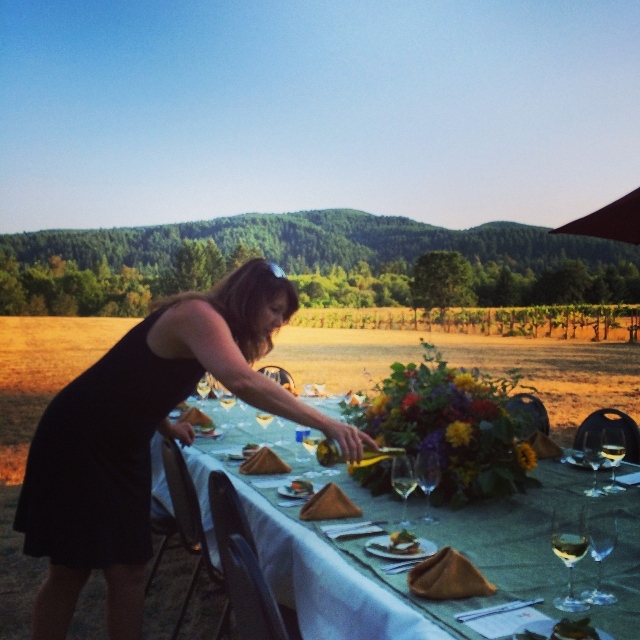 Domaine Meriwether owner Lorrie Normann pours Pinot Gris in preparation for the Wine Camp dinner – in an idyllic setting. After the hayride, campers dispersed for some down time prior to the evening’s festivities: a wine pairing dinner and an after-dinner marshmallow roast and bonfire. Some couples gathered at their camp sites with a glass of wine to socialize with other Wine Camp attendees while others played bocce ball, croquet and bean bag toss. 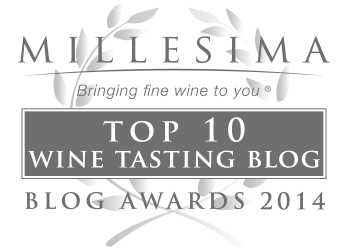 When we were called to return to the vineyard for the Wine Pairing Dinner, the sky was a radiant cloudless blue, and the sun that was beginning its descent to the west lit up the fir covered foothills like gold. A white clothed table with an eye-catching floral centerpiece was set for dinner and campers were greeted with a glass of Domaine Meriwether’s 2001 Brut Rose, a perfect match with the Chevre stuffed fresh figs wrapped in prosciutto. 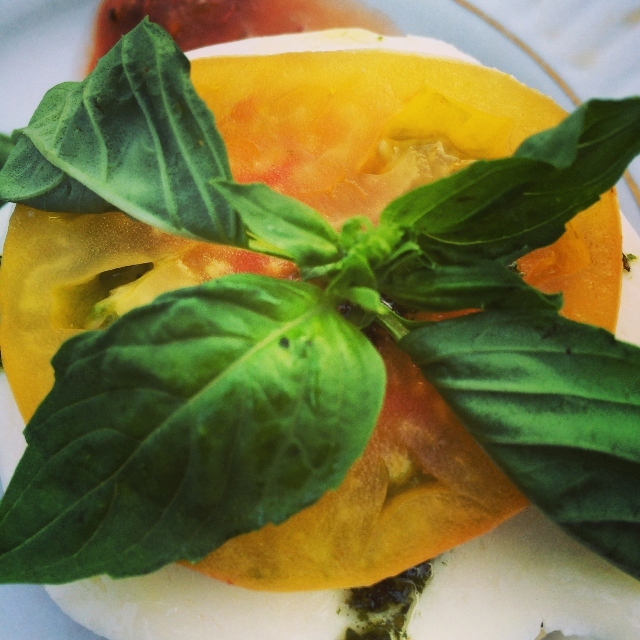 Stacked heirloom tomato caprese salad. Once we were all seated at the table for dinner, hosts Eric and Lorrie made a toast and our first of three hearty courses was served: stacked heirloom tomato caprese salad with honey balsamic reduction paired with Domaine Meriwether’s 2009 Pinot Gris – a delightful pairing of complementing flavors. Next, the Moroccan crusted lamb over creamy risotto was cooked so perfectly, it was hard to believe our entrees had been prepared in a food truck by a single chef. The presentation was gorgeous, and the pairing with Domaine Meriwether’s first-ever Syrah, vintage 2009, was simply divine. Dessert took on a campfire theme and mimicked the concept of a s’more, but our individual mason jar treats were far more indulgent: molten chocolate cake topped with bruleed marshmallow cream and cinnamon graham dust alongside a glass of Domaine Meriwether’s 2001 Vintage Cuvee. Just before the sun dipped behind the Coastal Range, Eric emerged from the winery with a long, shiny sword that he expertly slid down the neck of a sparkling wine bottle, sabering off the top with ease. Several willing candidates from our group of campers eagerly jumped at the opportunity to do the same. With Eric as their teacher, corks were flying and bubbles were flowing. The day’s events wound down as we gathered around the fire pit, sipped sparkling wine and shared ghost stories. Lorrie Normann tells a ghost story during the marshmallow roast and bonfire. Coffee, mimosas and continental breakfast were served outside by the morning fire; as well as, an option to purchase a full brunch from Chef Sullivan of Comforts Mobile Cuisine. Silently wishing it wasn’t ending, I already knew I’d be returning for Wine Camp 2015. The August 8 & 9, 2015 schedule of events is very similar to the events that took place in 2014, with one addition: Friday night check-in is available for an additional fee. 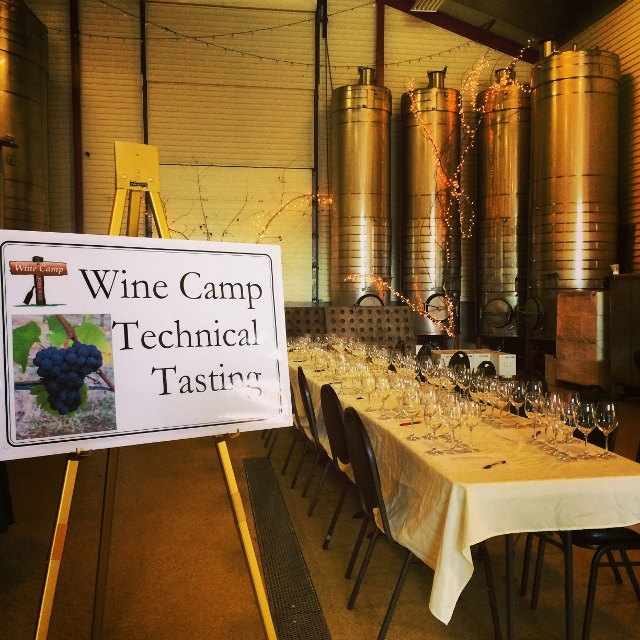 Visit winecamping.com for details and to purchase tickets.